Systematrix manufacture LUBRISYS range of oil lubrication system to include pimps & metering devices. The adjustable metering centrifuge is a unique product in the field of oil lubrication as it has features never found in other products before. 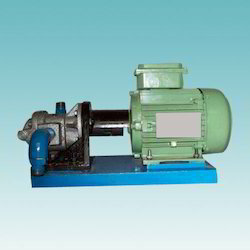 Small doses of oil to various parts of the machine is possible with a small power pack called the lubricating pump which runs on electric supply/Manual or pneumatic drive. Here, the use of LUBRISYS metering cartridges (sometimes called ‘injectors’) allows maximum number of points to be lubricated in a very systematic manner, so that lubrication is achieved regularly in small quantities with better frequency, thereby optimizing usage of lubricant, with no spillage of oils. The frequent lubrication ensures better life than conventional manual lubrication. The earlier problems of leakages, and not being able to understand if the cartridges are working are thing of the past. The Developed Cartridges have the advantage that there are no separate manifolds to hold the injectors hence no leakages. Indication pin is provided which moves up& down when the Metering Cartridges/ Injectors are in operation helping the user understand the lubrication process even without removing the pipelines. These injectors can be adjusted (up to 0.4 cc.) just by twist of screw which is a unique feature that we offer. 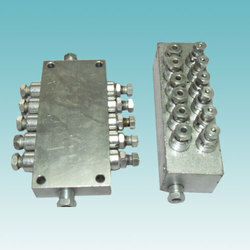 This will help in low stock management as different flows are achieved by the same injector, and as and when required. They can replace the older design cartridges, with no change in the pump, and are available separately without manifold required in range, starting from to 1to 16injectors in one block , which can be joined in parallel to other LUBRISYS adjustable injectors. The LUBRISYS Adjustable Injectors/Metering Cartridges with Indication, helps industries save time and money. Systematrix Engg Services manufactures LUBRISYS Recirculating oil Systems for most requirements. These are used in machinery wherein, the oil used by the parts is collected and re circulated using a pump. The common type of application are the enclosed gear boxes, however, for gears which are not enclosed spraying of oil is desired. There are types of systems which require many parts to be lubricated continuously, here use of LUBRISYS progressive distributors are used to ensure that all parts of the machine get the lubricant in equal amount. This system replaces splash lubrication as it is more reliable process. 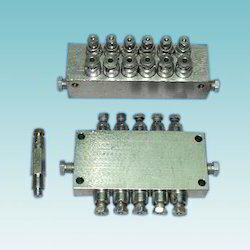 Majority of machines require small doses of oil to various parts of the machine. In this system a small power pack called the lubricating pump which runs on electric supply/Manual or pneumatic drive is used. Here, the use of LUBRISYSmetering cartridges (sometimes called ‘injectors’) allows a maximum no of points to be lubricated in a very small systematic manner, so that lubrication is achieved regularly in small quantities and with better frequency, thereby optimum usage of lubricant is achieved, thus no spillage of oils, and the frequent lubrication ensures better life than conventional manual lubrication. We have developed injectors/metering cartridges which not only perform better, but also indicate when the injectors are in operation, without the removal of pipes and other cumbersome methods. Unlike other injectors, our metering cartridges are made such that the flow of each injector can be controlled and a range upto 0.4 cc can be achieved on a single point. Hence adjusting the flow as per the requirement is possible. Looking for Oil Lubrication System ?